Denver — CTL|Thompson founder Bob Thompson has been named as the 2017 recipient of the ENR Mountain States Legacy Award. CTL|Thompson is the largest full-service geotechnical, structural, environmental and materials engineering firm headquartered in Denver. Thompson was honored at the ENR Mountain States 2017 Best Projects breakfast on Oct. 25. The prestigious award recognizes an individual who has achieved a lifetime legacy of service in design and construction. Recipients have contributed above and beyond to the engineering profession and their communities. 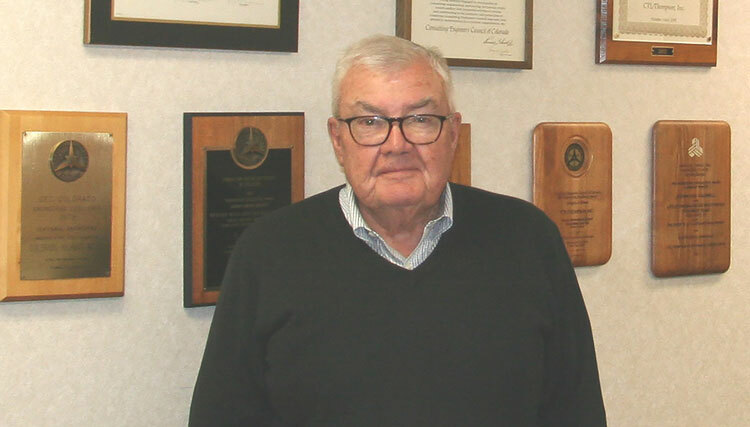 In his 55-year career, Thompson emerged as a national leader for devising engineering solutions to challenging slope stabilization and earth retention projects, especially in mountainous areas. He is also one of the foremost experts on expansive soil behavior and introduced technologies and testing that more effectively evaluated swell potential, prediction of heave, and mitigation techniques for building in expansive soil regions. Finally, Thompson has led the field on foundation design, mine remediation and anchor wall design for large excavations. His firm, CTL|Thompson, has provided geotechnical, structural and environmental expertise and materials testing on an estimated 100,000 residential and commercial building projects. ENR Mountain States also recognized Thompson’s commitment to elevating engineering practices. Specifically, his work established standard practices for geotechnical firms across the U.S. In 1995, Thompson joined forces with like-minded colleagues to establish what became the Colorado Association of Geotechnical Engineers (CAGE). He also was Past President with ASFE (GBA) and served on a board charged with accreditation approval for college engineering schools at universities nationwide. CTL|Thompson now has nine offices throughout Colorado and Wyoming. It celebrated its 45th anniversary last year.